Qigong is a general term used to describe internal exercises that use slow movements, breath control, and the mind to control the internal energy (qi) in the body for health benefits. 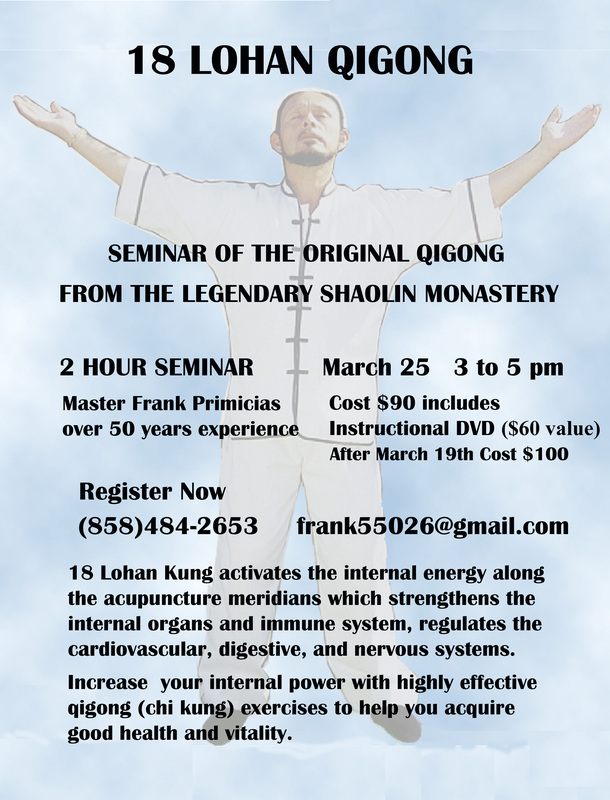 18 Lohan Qigong activates the internal energy along the acupuncture meridians which strengthens the internal organs and immune system, regulates the cardiovascular, digestive, and nervous systems. 18 Lohan Qigong also increases the flexibility and strength of the joints, muscles, and tendons of the body which aids in balance and overall health. from 3 pm to 5 pm in San Diego. Cost is $90 which includes the instructional DVD if payment is received by March 19th. After March 19th the cost is $100.